In the last two decades, new superconducting (SC) compounds, exhibiting surprisingly high critical temperatures (Tc), have been discovered. In contrast to conventional superconductors, the SC order parameter is not isotropic, neither in cuprates nor in Fe-based systems. This ignited a search for new SC pairing mechanisms based on the existence of rather strong electronic interactions. These interactions further render the materials extremely unstable against long-range ordering, which can either favor or compete with superconductivity, and thus give rise to extraordinarily rich phase diagrams. In conventional superconductors, the electron pairing interaction is mediated by an exchange of phonons. In the framework of Eliashberg theory, anomalies in the charge excitation spectrum, probed by tunneling and optical conductivity measurements, were directly connected to the density of phonons, measured by inelastic neutron scattering, thereby providing evidence for the leading role of electron-phonon coupling in these materials. In high-Tc cuprates, on the other hand, the mechanism responsible for superconductivity is still unknown despite 20 years of intensive research. Nevertheless, the observed structure of the low-energy electron spectrum is often considered to be the fingerprint of a strong electron coupling to some boson, which in turn is suspected to be a mediator of the SC pairing. In those materials, strong antiferromagnetic (AF) spin fluctuations, termed “spin-resonance” modes, were observed in the SC state by inelastic neutron scattering. Following early theoretical studies carried out at LLB, these excitations are now well understood as triplet excitons. The theory group has recently developed an improved version of the Eliashberg theory, and has shown  that spin-resonance modes could explain significant anomalies observed in the SC high-Tc cuprates: the d-wave SC pairing, the U-shaped angular dependence of the SC gap, the anomalous form of the electron density of states, and the renormalization of the electronic dispersion. This work establishes the scenario of spin-resonance–mediated superconductivity on solid theoretical grounds. F. Onufrieva and P. Pfeuty, Phys. Rev. Lett. 102, 207003 (2009). Figure 1. 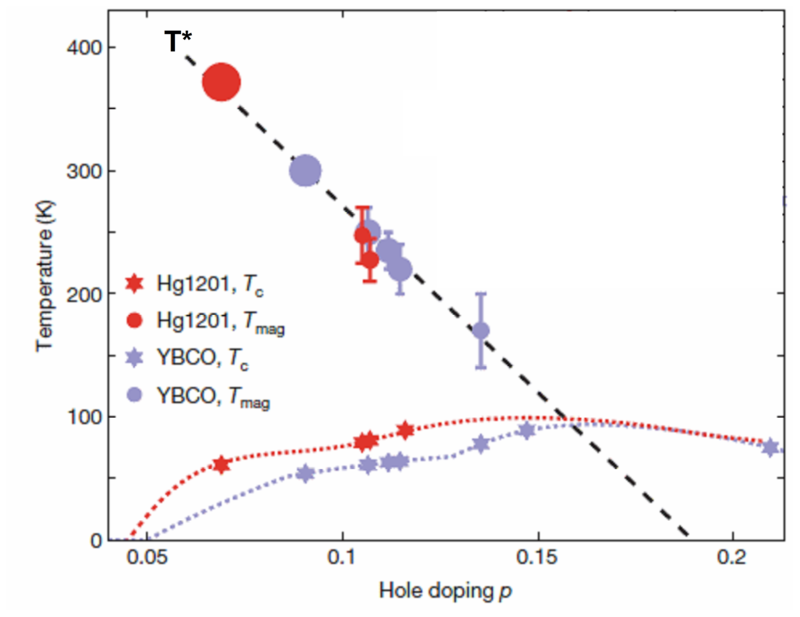 Universal pseudogap phase diagram: dependence on hole doping (p) of the superconducting critical temperature Tc and the ordering temperature Tmag associated with the appearance of an unconventional magnetic phase in YBa2Cu3O6+x (YBCO) and HgBa2CuO4+δ. (Hg1201). Tmag matches the temperature T* (dashed line), corresponding to the opening of the so-called pseudogap state, as derived from other types of measurements. From Ref. . Whereas ascertaining the origin of superconductivity in cuprates remains one of the major challenges posed to condensed matter physics, the anomalous electronic properties of those materials outside the SC state constitutes another, equally elusive, mystery. In particular, the low-energy electrons become partially gapped well above Tc in the so-called pseudogap phase (Figure 1). Recent, highly accurate, polarized neutron diffraction measurements have demonstrated the existence of a long-range magnetic order developing below the pseudogap–opening temperature T*. This pioneering work performed at LLB has stimulated international collaborations with several groups in the USA (H. Mook, Oak Ridge National Laboratory; M. Greven’s group, Standford University). Our observation was subsequently confirmed in two distinct families of cuprates, YBa2Cu3O6+x and HgBa2CuO4+δ . The magnetic phase breaks time-reversal symmetry, but preserves the lattice translation invariance. This implies the existence of staggered magnetic moments within each unit cell. The observed magnetic correlations are distinct from the usual antiferromagnetic spin-correlation, which are well documented from previous inelastic neutron scattering (INS) measurements. Here, in contrast, they are thought to possess an orbital-like character and could originate from nanoscopic current loops, as initially proposed by C.M. Varma in his theory of the pseudogap phase. The neutron scattering measurements indeed provide the first experimental evidence that the pseudogap phase is a long-range-ordered phase, competing with superconductivity in cuprates. The search for this novel magnetic phase is now being extended to other cuprate families, such as La2‑xSrCuO4 and Bi2Sr2CaCu2O8+δ, through new collaborations with other groups in France (I. Laffez, LEMA, Université de Tours) and Switzerland (J. Mesot, Paul Scherrer Institute, Villigen). Y. Li , V. Balédent, N. Barišić, Y. Cho, B. Fauqué, Y. Sidis, G. Yu, X. Zhao, P. Bourges, M. Greven, Nature 455, 372-375 (2008). Recent INS measurements, carried out in strongly underdoped YBa2Cu3O6.45 (Tc = 35 K), have demonstrated the existence of quasi-one-dimensional (1D) incommensurate spin fluctuations, developing spontaneously below 150 K . This observation highlights the spontaneous breaking of rotational invariance in the system. On cooling down, the lattice translation invariance is further broken, while incommensurate spin fluctuations freeze at short distance. Static correlations can be enhanced by applying an external magnetic field. In addition to INS measurements, electrical transport properties exhibit a significant 1D anisotropy, while quantum oscillation measurements in high magnetic fields suggest a folding of the electronic band structure, which is associated with a state which breaks the lattice translation invariance. All these findings point toward the existence of an electronic nematic instability, where rotational symmetry is spontaneously broken at long distance as a result of strong electronic interactions. This instability leads to an electronic smectic state when the translation invariance is further broken. Such mechanisms are also regarded as likely candidates for explaining the anomalous electronic properties of cuprates in the pseudogap phase. These results are the fruit of a long-standing collaboration between the LLB and the MPI in Stuttgart. V. Hinkov, D. Haug, B. Fauqué, P. Bourges, Y. Sidis, A. Ivanov, C. Bernhard, C. T. Lin, B. Keimer, Science 319, 597 ( 2008). Magnetic superconducting “glue” for Fe-based superconductors? Non-superconducting MFe2As2 (M: Ca,Fe) shows a crystallographic transition from a tetragonal phase to an orthorhombic phase, accompanied with an AF spin-density wave order. Upon doping with either electrons or holes, the structural and magnetic transitions vanish and the system becomes superconducting. The unconventional “s+/-” SC order parameter is believed to reflect an attractive interaction mediated by the exchange of strong AF fluctuations inherited from the spin-density-wave state. Within a collaboration between the MPI Stuttgart (B. Keimer’s group), FRM-II Munich and the LLB, the AF spin excitation spectrum in electron-doped BaFe2-xCoxAs2 was recently mapped out at temperatures spanning the transition from the normal to the SC state. Furthermore, the dynamic spin susceptibility could be determined in absolute units , providing highly valuable information for theories and allowing the coupling strength between electrons and spin fluctuations to be quantitatively evaluated. The role of lattice vibrations in superconductivity was also investigated in non-SC MFe2As by the Karlsruhe group at LLB in collaboration with Th. Brückel and his collaborators (Forschungzentrum Jülich, Germany). INS measurements of the phonon dispersions and comparison with density functional theory (DFT) calculations indicate that theory correctly reproduces most phonon frequencies, but fails to account for the anomalous temperature dependence of some modes . The coupling of vibrational and electronic degrees of freedom appears stronger than predicted by DFT and the role of phonons in the superconductivity of Fe-based superconductors could be more significant than anticipated. The importance of both magnetic and lattice degrees of freedom is further supported by first-principle calculations carried out at LLB  for FeSe, another newly-discovered iron-based superconductor. Spin-polarized calculations of all frozen phonons at the Brillouin zone center show a significant deformation of the electronic band structure near the Fermi level for several modes involving a displacement of the chalcogen. The particular B2u(Se) phonon mode shows a strong linear coupling with the AF order parameter, leading to a substantial electron-phonon coupling, which can partly account for the superconducting critical temperature Tc when the weak coupling BCS theory is used. Nevertheless, the strong linear coupling of this B2u(Se) mode with the magnetic order parameter strongly suggests that magnetic fluctuations are another necessary ingredient to fully account for the high Tc observed in this system. D. S. Inosov, J. T. Park, P. Bourges, D. L. Sun, Y. Sidis, A. Schneidewind, K. Hradil, D. Haug, C. T. Lin, B. Keimer, V. Hinkov, Nature Physics 6, 178 (2009). R. Mittal, L. Pintschovius, D. Lamago, R. Heid, K-P. Bohnen, D. Reznik, S. L. Chaplot, Y. Su, N. Kumar, S. K. Dhar, A. Thamizhavel, and Th. Brueckel, Phys. Rev. Lett. 102, 217001 (2009). A.H. Moudden, Eur. Phys. J. B 64, 173 (2008).